Meet Raquel of Steve’s Club Camden. She dreams of studying to be a RN and working as a Labor and Delivery nurse. The Local Club is part of Steve’s Club National Program, a nationwide non-profit organization that brings fitness, nutrition and personal development to at-risk youth. There are now 30 Local Clubs across America helping kids “beat the streets” by giving them a safe place to workout, learn and grow. Each of the Local Clubs have their own unique program, but all work to uphold the 9 values laid out by the Steve’s Club National Program: integrity, teamwork, discipline, respect, support, character, improvement, positivity and community. Raquel’s hometown of Camden, NJ has been described as one of the most dangerous cities in the country. As the poverty and crime levels skyrocket, so does the obesity rate. According to a recent study conducted by the Rutgers Center State Health Policy, 40% of Camden City children are overweight or obese. 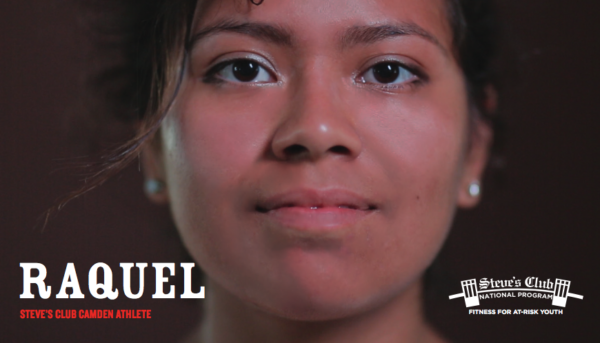 Helping at-risk youth like Raquel realize their potential through fitness, nutrition and leadership skills is the driving force behind Steve’s PaleoGoods. Each purchase changes lives—15% of the proceeds go directly to Steve’s Club National Program. Raquel has been at Steve’s Club for just over a year, and partner workouts are her favorite. When asked what exercise is her least favorite, she has no answer. She loves it all.